Scrambled eggs, Chorizo Sausage, Cheddar-Jack Cheese & Salsa served in a Honey Wheat Wrap with a garnish of grapes. Scrambled Eggs, Crisp Bacon and Cheddar Cheese melted on a toasted Croissant, served with a garnish of grapes. Scrambled Eggs, Ham and Cheddar Cheese melted on a toasted Croissant, served with a garnish of grapes. Fresh local Sausage, scrambled eggs and melted cheddar cheese, on a toasted croissant, served with a garnish of grapes. Salmon and cream cheese on a freshly baked bagel served with a slice of tomato and red onion...Delish! 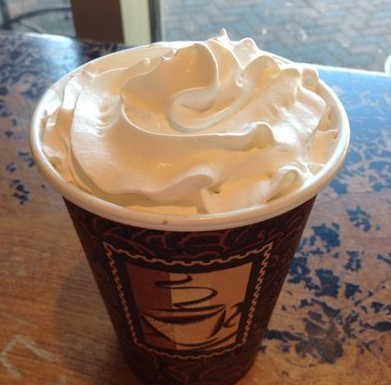 Sliced & toasted with your choice of cream cheese or butter. Slices of fresh Banana served with Peanut Butter on a Freshly Baked Bagel...What a combination! Thick and flavorful, our French Toast is served garnished with powdered sugar & strawberries. A decadent twist on a breakfast favorite...rich Brie Cheese is melted between the Toast & garnished with powdered sugar & strawberries. Possibly the Best Grits you'll ever eat...Sprinkled with Cheddar Cheese! Our Homemade Granola layered with fresh fruit, yogurt & Blueberry & Strawberry sauces. Not the Parfait, but a bowl of our homemade Granola topped with fresh fruit. You add the milk for a great breakfast cereal treat. Light and sweet, our Strawberry Crepes are served with a dollop of Whipped Cream & Strawberry Sauce. Scrambled Eggs, Chorizo Sausage, Cheddar-Jack Cheese & Salsa wrapped in a honey wheat tortilla. Scrambled Eggs tossed with Green Peppers, onions, ham & Cheddar Jack Cheese served with Wheat Toast and a tortilla chip garnish & grapes. Scrambled eggs tossed with a vegetable medley of Broccoli, corn, edemame, onions, green pepper & cheddar jack cheese, served with 9 grain bread & grapes. Scrambled Eggs, local Chorizo Sausage, Salsa & Shredded Jack Cheese garnished with tortilla chips! Ole! 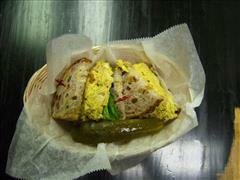 A flavorful mix of scrambled eggs, Cheddar/Jack cheese, peppers & onions, served with Wheat Toast & a Fruit Garnish. Bacon, Scrambled Eggs, Wheat Toast, Home Fries, served with a fruit garnish. Bacon, Scrambled Eggs & Nine Grain Toast, served with a side of fresh fruit. Cheddar, Jack & Swiss cheeses in a fresh omelet, served with wheat toast & a fruit garnish. Bacon, Onions & Swiss Cheese in a Fresh Omelet served with Wheat Toast & a fruit garnish. Chili Marinated Chicken, Cheese & Black Beans in a hearty omelet topped with Salsa, served with Wheat Toast & a fruit garnish. This decadent dish combines the best BBQ Chicken with Aromas' version of bacon infused Macaroni & Cheese. Atlantic Salmon filet served on a bed of exotic grains with fire roasted vegetables, plus a vegetable medley drizzled with honey citrus chili glaze. Two Roasted Portobello caps with basil pesto marinara & melted cheese served with mixed greens. Black beans & chili-marinated chicken atop creamy penne pasta with salsa & sour cream. a Southern specialty with caramelized BBQ shrimp served over a mound of creamy stone ground grits and garnished with cheddar cheese. Oven toasted tortilla chips with salsa, sliced jalapenos, and sour cream, covered with melted Cheddar and Monterey Jack cheeses. 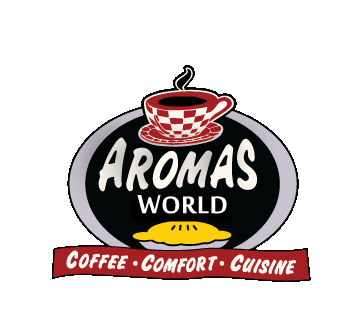 Aromas is a family friendly cafe and children are important to us as customers. That is why we have a Kids Menu that our junior visitors can enjoy. From Mac-N-Cheese and Nachos to sandwiches and peanut butter & jelly, everything is made with extraordinary care and precision to please your gourmet children. made how they like ‘em...PLAIN. Plain noodles w/butter & Parmesan cheese. (Peanut Butter & Jelly) Comfort food for the youngsters, served with goldfish crackers. Turkey and cheese on white bread (Plain, Plain, Plain, that means no Fixins). Cheddar Cheese Penne Pasta infused with Bacon bits! Mixed greens, cranberries, toasted pecans, tomatoes, cucumbers, & onions with crumbled bleu cheese & our Cider Vinaigrette dressing suggested. Teriyaki-marinated flank steak or salmon (specify on order) served over mixed greens, with carrots, onions, cucumbers & chow mein noodles & sesame ginger dressing garnished with cusabi dressing. Mixed greens, feta cheese, tomatoes, olives, pepperoncini & onions w/ Balsamic Vinaigrette. Turkey, ham, bacon, & bleu cheese over mixed greens w/ cucumbers, carrots, tomatoes, onions & egg. Sauteed chicken breast with cucumbers, red onions & tomatoes served over mixed greens with chow mein noodles & sesame ginger dressing. A colorful plate of seasonal fruit served on a bed of lettuce. Please call your nearest Aromas location for the soup of the day. (10:30 am til Close!) 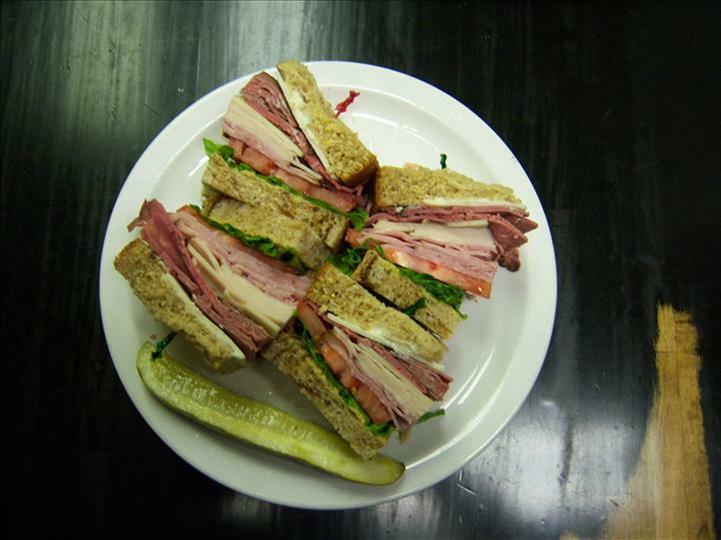 whether it is morning, lunchtime or evening our sandwiches are a great nutritional choice, served from 10:30am til close. We served a large variety from the classic BLT to our signature Aromas Club Sandwich. We have a number of vegetarian sandwiches too including famous Portobello Burger and Mediterranean Melt. Slices of Roast Turkey Breast, Baked Ham, Bacon, Swiss and Provolone. We use one slice each of Wheat and Rye breads along with Tomato, Lettuce, Mayo and Dijon mustard. Hickory Smoked Ham, sliced w/ Swiss cheese, lettuce, tomato, mayonnaise and Dijon mustard served on marble rye bread. The all-American classic sandwich of crispy bacon, lettuce & tomato, served on toasted white bread with mayonnaise. Our original curried chicken salad recipe w/grapes, served with lettuce on yummy fruit & nut bread. Fresh Pastrami on toasted marble rye with melted Swiss, lettuce, tomato and European-style mustard's. Portobello mushrooms, roasted and served on a kaiser roll with slices of provolone cheese, alfalfa sprouts and balsamic vinaigrette served w/a pickle. Served with melted cheddar, red onions, lettuce, tomato & mayo. Slices of roast beef piled onto ciabatta bread with provolone cheese, mayonnaise, horseradish, lettuce & tomato. 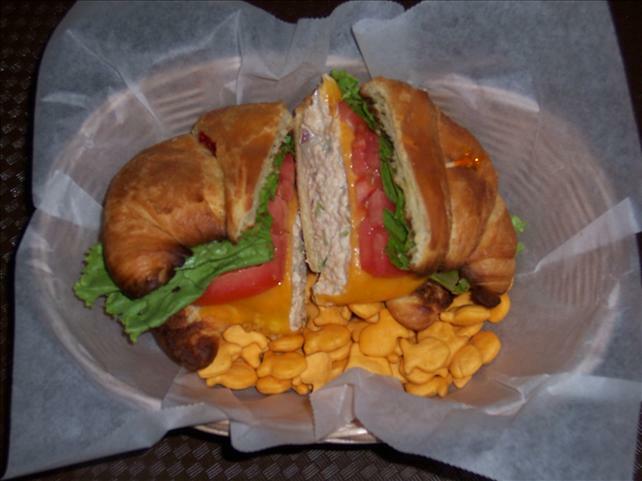 Aromas fresh tuna salad, melted cheddar, lettuce & tomato on a toasted croissant, served with Pepperidge Farms Goldfish! Roasted turkey on multigrain w/ cheddar, lettuce, tomato & our chipotle mayonnaise. A trio of melted cheddar, provolone and Swiss on nine grain w/mayo, Dijon mustard, lettuce and tomato. Carrots, cucumbers, red onions, alfalfa sprouts, lettuce & tomato w/provolone on a honey- wheat wrap w/ cucumber wasabi sauce and tortilla chips. Exotic Grains and Fire-Roasted Vegetables, Mango Salso, Provolone Cheese and Honey Citrus Pepper Sauce served on a Honey Wheat Wrap with tortilla chips. Chili-marinated chicken breast w/Cheddar and Jack cheese, salsa, lettuce, buttermilk ranch dressing, in a lightly toasted honey-wheat tortilla served with corn tortilla chips. Rich, dark chocolate fondue served over flame with poundcake, fruit, & marshmallows for dipping! Creamy Brie Cheese fondu served over flame with apples, bread & strawberries for dipping. Oven toasted tortilla chips with salsa, sliced jalapeños, sour cream and melted cheddar & monterey jack cheeses.